A variety of market mechanisms have been proposed and implemented around the world in order to create competitive electricity pools and exchanges. However, it is an open question whether pool-based daily auctions or continuous bilateral trading deliver different prices under conditions of market power. In this paper we present a computationally intensive simulation model of the wholesale electricity market in England and Wales to isolate and systematically test the potential impact of alternative trading arrangements on electricity prices. After eight years of trading under a pool-based system, proposals were initiated in 1998 to change the market in England and Wales to bilateral trading. This paper uses an agent-based simulation to evaluate two important aspects of that proposal. The results show that daily bidding with Pay SMP settlement, as in the original Pool day-ahead market, produces the lowest prices while hourly bidding with Pay Bid settlement, as proposed for the bilateral model, producesthe highest prices. OPEC and World Crude Oil Markets from 1973 to 1994: Cartel, Oligopoly, or Competitive? This study investigates the existence of a dominant producer in the world crude oil market for the period 1973 to 1994. Contrary to the literature, the results show that neither OPEC nor the OPEC core can be characterized as a dominant producer. Using statistical tests, we also investigate whether OPEC, the OPEC core, or Saudi Arabia fit the competitive model or the Cournot model, The statistical results reject all models except the dominant firm model for Saudi Arabia. New user cost estimates are introduced and included in the models. Ail alternative explanation of high OPEC profits in the 1973-82 period is also developed as part of a statistical test of the effect of the US oil price regulation on world oil demand and supply. An estimate of the wealth transfer from price regulation is also calculated. During the next decade, most states in the USA will deregulate electricity generation. Nuclear power plants that were ordered and built in a regulated environment will continue to be regulated as nuclear facilities. However, under state deregulation the price they receive for their electricity will be set largely in non-regulated markets. This paper examines the competitiveness of the nuclear power industry with a probabilistic model to identify which nuclear power units face the highest risk of early retirement under deregulation. Projected outputs under both average-cost and marginal-cost pricing are compared with expected generation under continued rate-of-return regulation. Nuclear units at risk of early retirement are in regions with the lowest forecast prices or are old plants. But, if CO2 regulation targets an emission reduction to 9 % below projected 2010 levels (projected to be 24% above 1990 levels), there are only a few units at risk of early retirement after 2015. 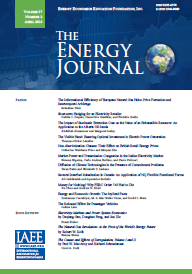 The 1999 Special Issue of The Energy Journal presents several articles that conclude the costs of the Kyoto Protocol would be very high for the U.S. if all the adjustments were domestic. However, a few studies conclude that the Kyoto target is achievable at a negligible cost and perhaps with a net benefit. This paper explains why a majority of studies conclude that the cost of reducing emissions is high while some studies conclude that the Kyoto target could be achieved at a low cost, if not for free. Most studies employ mainstream economic analysis to estimate the costs of achieving the Kyoto Protocol. In contrast, the "no cost" analyses use a unique methodology applied only to energy conservation and referred to here as the energy conservation paradigm. One conclusion is that the energy conservation paradigm is inconsistent with mainstream economics. The "no cost" conclusion used to support approval of the Kyoto Protocol is not supported by the basic principles of economics. The Climate Change Technology Initiative recommends tax credits to reduce carbon emissions. With the proposed tax credit of $1,100 per residential head pump, each tonne of carbon reduced from the more efficient heat pump would cost $510. With different input assumptions, higher and lower estimates are produced. In the United States, rural electric cooperatives have an aging distribution system (1 million miles of distribution wires were originally installed over 40 years ago) and a load density that is about one-tenth of the load density at other utilities. The result is that there may soon be a large market opportunity for photovoltaics (PV) and other distributed resources. This paper calculates the cost of replacing portions of the distribution system as it wears out with hybridPV systems, compares it to the cost of replacing the system with equivalent distribution system equipment, and selects the alternative with the lowest cost. Results suggest that there is a potential market of 500 MW to 950 MW of PV at a price of $3,000/kW (a 50 percent reduction over PV prices in 2000) and a corresponding fossil-based generation market size of 280 MW to 555 MW at a price of $1,000/kW The hybrid-PV systems could replace 7 percent to 16 percent of the miles of distribution system and could save co-ops $1.0 billion to $2.5 billion (present value).